The Santa's Izzy Elves stories are not your usual picture books: older kids who are fans of Shel Silvertein will enjoy these, too!One reason for this is that although these stories echo the famous 19th century poem, "A Visit from St. Nicholas" Santa's Izzy Elves are definitely 21st century, with electronic devices galore in their North Pole workshop!A recipient of the prestigious Mom's Choice Award in the e-book category, this Christmas story in verse celebrates the power of children's imaginations and the magic of books. It tells what happens when two naughty boys find Tizzy, one of Santa's elves, stranded in their living room. Tizzy tells them that Santa's sleigh is powered by the imaginations of children, and pleads with them to use the power of their own imaginations to send him home. But how?"... a clever holiday read-aloud story featuring two excited siblings who sneak down early Christmas morning and discover a very special surprise. Only through their discovery of the magic of books do they find a way to send Tizzy back home. Kudos to the author for highlighting the importance of books! I recommend this book to be read aloud to children ages 5 and older."  Renee@Motherdaughterbookreviews.com. 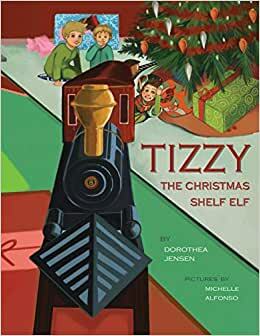 Start reading Tizzy, the Christmas Shelf Elf: Santa's Izzy Elves #1 on your Kindle in under a minute. New Hampshire author Dorothea Johnson Jensen was born in Boston. As a child, she moved to Chillicothe, Illinois, the same town where Johnston McCulley, the writer who created Zorro, lived many years earlier. Jensen majored in English Literature (Carleton College) and earned an M.A. in Education (University of New Mexico). She has served in the Peace Corps in South America, tutored refugees in ESL, taught junior high and high school English, and written grant proposals for arts organization. She and her husband have three grown children and six grandsons, and have lived all over the United States, as well as in Brazil and The Netherlands. Jensen's first historical novel for young readers, The Riddle of Penncroft Farm, was named an International Reading Association Teachers' Choices Selection soon after publication. It is used in classrooms throughout the U.S. as an enrichment resource for studying the American Revolution. Jensen's second historical novel for young readers, A Buss from Lafayette, was released in 2016 and has won a number of honors and awards since its publication in 2016. It concerns a witty, troubled young girl whose life might just be changed by a playful kiss from a great hero of the American Revolution. With a colleague, Sienna Larson, Jensen has written a complete teacher's guide for A Buss from Lafayette. This makes it easy to use this story in the classroom to enrich study of the Revolution, General Lafayette, and life in the early 19th century. Jensen is now working on a story set in 17th century Massachusetts, called A Scalp on the Moon. Tizzy, the Christmas Shelf Elf was Jensen's first illustrated story in verse for elementary school-aged children. She has now completed three sequels: Blizzy, the Worrywart Elf, Dizzy, the Stowaway Elf, and Frizzy, the S.A.D. Elf. Modeled on the classic poem, "A Visit from St. Nicholas," these all feature decidedly 21st century elves and have won honors/awards. She plans to write a story for each of the remaining Izzy Elves: Bizzy, Whizzy, Fizzy, and Quizzy. In addition to writing, Jensen is an experienced actress and singer.Jensen is enjoying putting her old acting skills creating video blogs and podcasts, and narrating her stories. Her four Izzy Elf stories and A Buss from Lafayette are now available as audiobooks. This is the first in the elf series. The story is fast paced and right on target for the holiday. The elf , Tizzy wants to get home for Christmas but is stuck somehow with the boys. They try wishing him home on a toy train but he only gets dizzy. Then they try the video game but monsters try to get him so that doesn't work. Next up, a book filled with imagination and dreams. This is exactly right. Tizzy is found, happy and safe back with his family for Christmas. I must address the kindle format. The font was teeny and hard to read. The story was limited to one page of dialogue, then an illustration. This isn't always optimal for children as they like to look at the pictures as we read. Otherwise a good story. Terrible knock off of elf on the shelf. The paragraphs are written as long run-ons that are very difficult for children to read, even as an adult I had found it hard to read. Sketches are low quality. Don't waste your money on any of the books in this series. 5.0 out of 5 starsVery, very clever! Such a wonderful story that compares modern gifts at Christmas time with the imaginations of children which can be used just as effectively during the Yuletide spirit. Young children, pre-readers, and yes, even adults will enjoy this illustrated make believe version set to the rhyme of "Twas the Night Before Christmas". Jensen's creativity is cleverly shown throughout the story and of course, her resourcefulness makes for a very happy ending! I'm anxious to read more of the Izzy Elves to see what she comes up with in future stories! This charming story in couplets would be a compelling Newbery contender. The tale, told with an impish warmth, opens in a form briefly reminiscent of Clement Clarke Moore's beloved story of Santa's visit; then shifts into the two kids' own warm world and what they experience through their own imaginations and powers of empathy as they grapple with a stranded elf's plea for help.